1) The quantity. I decided to make this our monthly staff meeting so I would need to make like 4 batches of them so I wanted to keep it simple. Keep it simple stupid. 2) I’m lazy. I did not feel like making my own caramel or chocolate sauce, esp for so many little cheesecakes. 3) Nut allergies. When I made a delicious chocolate cake with a peanut butter frosting last fall and saw that a few people could not eat it I decided that I would try really really hard not to make treats with nuts so the pecan on top and the pecan meal in the crust had to go. 4) Never made this many cheesecakes before. ‘Nuf said. I love the cheesecake recipe because it made a really creamy cheesecake. I don’t really like cheesecake because it seems like I’m eating a block of cream cheese, and while I like cream cheese, I like small quantities on a bagel. Anyway, take the time to let your cream cheese and butter to soften otherwise your cheesecake might have some lumps in it. Plus your mixer will hate you, and possibly make funny noises fighting the tough fight. Take the cream cheese out of the box, so it is just sitting in the foil wrapper, since this dramatically reduces the time it takes to soften up. PS- Sorry for the crappy photos I got up at 5.45am to make them so I just wanted to bake and get ready for the day and not worry about photos. Then I forgot to take a photo of the finished result so I was stuck with taking a photo of the prettiest of the uglies, since they got banged up on the way in to work. Preheat the oven to 325. Line a 12-muffin pan with aluminum liners. To make the Crust: Put Oreos into a large resealable bag to crush with a rolling pin. Continue rolling Oreos until they are finely crushed. 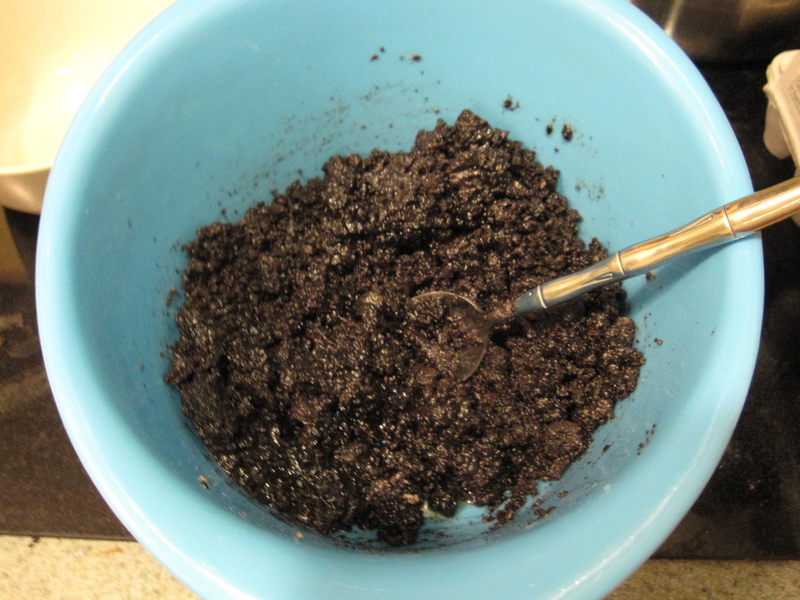 In a medium bowl, combine the Oreo crumbs with the melted butter. Divide the crust mixture into the muffin liners. Press down the mixture firmly with your fingers. Bake the empty crusts for 5 minutes. To make the Filling: Using a hand mixer or stand mixer, beat cream cheese until creamy. Gradually add the sugar, salt, and vanilla; beat well. Add eggs one at a time, mixing just until blended. Stir in yogurt. Evenly divide the filling into the baked Oreo crusts, about a 1/4 cup of filling. The filling should should come almost to the top of the liner. Bake for 15 minutes or until tops of cheesecakes are puffed and only slightly jiggly in the very center. Cool to room temperature and then refrigerate for at least a couple hours, preferably overnight, until serving.